Hi, Duffy Brown here. It’s summer and families and friends get together in the back yard, the park, at a friend’s house. There’s always lots of great food and chit-chat and then there’s the games. One of my favorite games when growing up was croquet. Yep, we laid out the course, had our favorite lucky colors and loved blasting each other all over the yard when we hit their ball. We played a lot of hide and seek and that’s still a fav with the younger kids. We had this huge yard with garages and gardens and trees. At night with flashlights was the best and the scariest. My grandfather taught me how to play bocce ball. He was from Italy and bocce ball is big in Italy. I still have his bocce ball set. What a treasure. 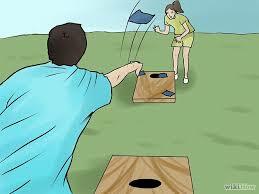 A fav at our house is corn hole. This is where you toss beanbags in holes cut into plywood tilted at an angle. You do it in teams which is always fun and that you can toss with one hand and hold a beer with the other makes this game an instant crowd pleaser. Remember the game Jinga where you pull out slats of wood and try not to topple the whole stack? Well, my daughter just made a yard version of this where the stack of wood is about four feet high and you have to pull out the two-by-fours and try not to collapse the stack. 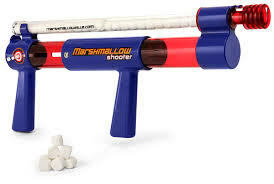 Squirt gun battles are always great backyard fun as are marshmallow wars where players are armed with marshmallow guns and shoot at each other. That you can eat the ammo is a definite plus. So what about you? Got a fav backyard game for family and friends? I love hearing about all your summer fun! We played a lot of lawn darts back in the day. The "darts" with the weighted ends just are not the same as the pointy ones. Lately we've been playing the ladder game where one tosses weighted strings at ladder rungs. Isn't this basicly how David killed Goliath? These things seem more dangerous than giant plastic darts. How safe are horseshoes? Hard metal objects flying about. 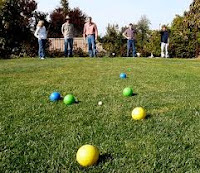 Bocce' is a good picnic game, easy to transport. Not a good game if you bring dogs along. Hard to beat Euchre, even at a picnic. MJ, you made me laugh, as usual. The past few weeks have been murderously HOT in Texas, but fortunately my brother has a pool in his backyard, so when we're not just swimming or floating around, we play pool badminton or volleyball and it's great fun.